Happy Holidays! 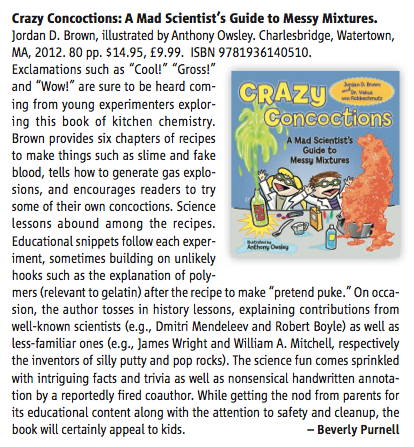 I was delighted to discover that a kids chemistry book I recently wrote, CRAZY CONCOCTIONS, was reviewed in Science magazine. 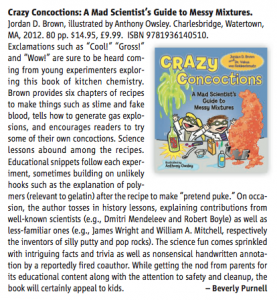 Spread the word to any young mad scientists you know. But please don’t tell Dr. Fickleschmutz. This entry is filed under Books, Movies, TV, Catchall, children science books, Jordan D. Brown, My Latest Work. Subscribe to the Comments RSS feed.